The need for full-depth repairs should be determined based on the type, frequency, and severity of existing deterioration of the pavement. The Distress Identification Manual for the LTPP Project, Strategic Highway Research Program, National Research Council, 1993. 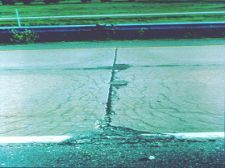 FHWA, included description of joint and crack distress at low, medium and high severity levels. Recommendations are provided in Table 1 as to the level of severity of each distress type that warrants full-depth repairs. Each agency should examine these recommendations and modify them as needed to more closely fit local conditions. The following are typical concrete pavement distresses that may require full-depth repairs. The criteria for applying FDR for each distress is also presented. Transverse cracks that remain tight (hairline cracks) and do not extend to the bottom of a slab do not require any special treatment, (e.g., plastic shrinkage cracks). Most plastic shrinkage cracks remain very tight and extend into the slab about 25-50 mm (1-2 in). 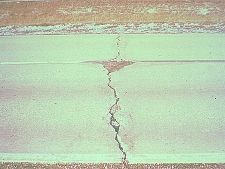 These hairline cracks do not allow much water to penetrate the pavement substructure and rarely deteriorate or influence the serviceability of a concrete pavement. Low severity working cracks with poor load transfer may be repaired by restoring the load transfer using dowel bars (See Publication No. FHWA-SA-97-103 for details). Medium to high severity distress working cracks are good candidates for FDR. 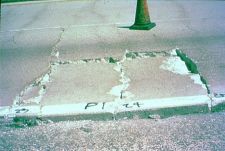 Longitudinal Cracking - When longitudinal cracks deteriorate to a high severity condition, they warrant full-depth repairs. A high severity condition indicates that a crack is greater than 12 mm (0.5 in) wide, spalling extends more than 150 mm (6 in) from the crack, and faulting is greater than 12 mm (0.5 in). If the condition is less severe, other CPR procedures, such as partial depth repairs, cross-stitching, retrofit dowel bars, or sawing and sealing are sufficient. "D" cracking - "D" cracking is a pattern of cracks caused by the freeze-thaw expansive pressures of certain coarse aggregates. The disintegration and spalling associated with these stresses normally begins near the joints as a result of the higher moisture levels necessary for the course aggregates to expand in volume during freezing. Medium and high severity "D" cracking could warrant full depth repair. However, like for any other materials related distress, FDR only provides a temporary treatment. Shattered Slabs & Corner Breaks - Corner breaks and intersecting cracks develop in slabs receiving marginal support from the subbase or subgrade. Any heavy loads that pass over these slabs cause large vertical deflections and high tensile stresses in the concrete. Over time the unsupported slab will pump subbase or subgrade fines out from beneath the slab, leading to voids and eventual cracking over the uneven support. Shattered slabs also may result from frost heave or swelling soil problems. Shattered slabs and corner breaks are good candidates for using FDR. Punchouts - Punchouts in continuously reinforced concrete pavements (CRCP) are candidates for full-depth repairs as they represent a structural failure of the pavement. They form after many load cycles when the longitudinal steel ruptures along the faces of two closely spaced cracks, usually less than 0.6 m (2 ft) apart. Blowup - Blowups occur in hot weather at transverse joints or cracks which do not allow sufficient expansion of the concrete slabs. The insufficient expansion width of joints is usually caused by infiltration of incompressible material into the joint. Blowups of any severity warrant full-depth repairs due to the localized disruption to pavement integrity and the potential safety hazard.